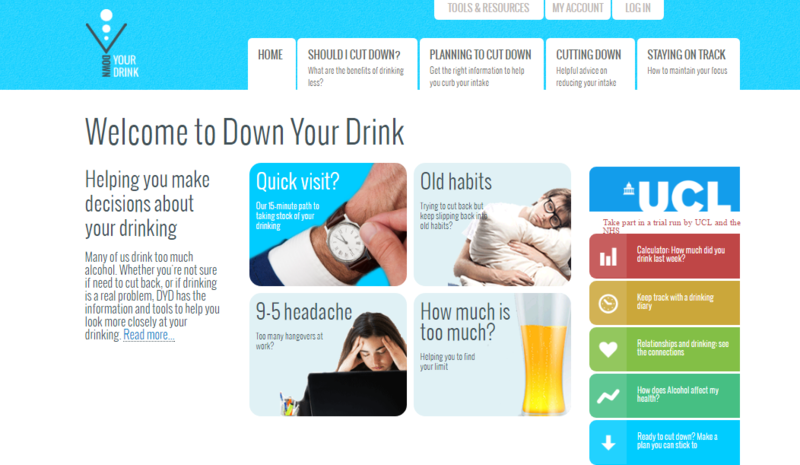 Down Your Drink (DYD) is a web-based program intended to provide people with the information they need about alcohol consumption. Through a 15-minute guided visit, users enter information about their weekly alcohol consumption patterns and receive feedback on their risk level for alcohol-related problems and the benefits of cutting down. In a worksheet, users are encouraged to manually list and compare benefits of not changing vs. changing their drinking habits. DYD provides users with psychoeducational information (text-based) on the benefits of reducing alcohol consumption, how to reduce alcohol consumption, and how to stay on track. It also addresses how to handle risky situations, refuse drinks, deal with cravings and urges, and be assertive in the face of peer pressure. Users can maintain a diary to track their daily alcohol consumption and check on their progress. Additional features include tools to calculate blood alcohol levels and units of alcohol consumed; worksheets to record binge drinking episodes and factors preceding these episodes (e.g., social situations, feelings, and emotions); and the Severity of Dependence Scale to measure users’ dependency on alcohol.